Our customer relationships have allowed us the opportunity to provide solutions in many locations. Click on a pin for more project information. Experience is best on a desktop computer. Home to Ayars & Ayars, Inc. and ARCHI + ETC. LLC, the green building practices and principles used to develop and construct this project complements our dedication to promote the importance of holistic, sustainable design. The well-known pet food manufacturer, Blue Buffalo, partnered with AR Nebraska Investment, LLC, with Ayars & Ayars, Inc. as their Desing/Builder. Ayars & Ayars, Inc. has been building lasting relationships for over 30 years and continues to do so today. Garner Industries is a prime example of one of those great connections. Highlighting the abilities of Ayars & Ayars, Inc’s Special Projects Group, the goal of this project was to return structural integrity to the facility’s walls and roof. Ayars & Ayars, Inc. was excited to get to work with the Ponca Tribe of Nebraska again, this time with the OSNI Ponca, LLC to construct their new smoke shop in Carter Lake, Iowa. Creating an inviting presence that reflects Cornhusker Bank’s reputation of strength, community involvement and customer service was the goal of this design-build exterior renovation project. Ayars & Ayars, Inc. is committed to delivering the highest quality of work on all of our project from start to finish. That is why CKO chose to work with us. This project included a build out to establish their first facility in Omaha, Nebraska. When Cannon Equipment needed help stabilizing failing structural supports, they chose Ayars & Ayars, Inc’s Special Projects Group to effect repairs. Benchmark BioLabs showcases Structural Insulated Panel (SIP) construction. SIPs are high-performance building panels used as walls and roofs systems for light commercial buildings. The panels are formed by sandwiching a core of rigid foam plastic insulation between two structural skins of oriented strand board (OSB), or plywood. The Blue River Family Resource Center administers programs designed to address the needs of families in Saline County. Amenities include: day care facilities, community meeting rooms, kitchen, food pantry, staff offices and playground. This self-storage facility features all the amenities one expects: secure entrances and availability of both drive-up and climate controlled storage units. Big Red Self Storage operates several storage centers throughout the area - this location maintains 100 unique storage units in various configurations. This former restaurant is now home to the Federal Office of Homeland Security. Baggage inspectors and other security personnel for the Lincoln airport are trained and managed here. As part of a groundwater remediation project in the Hastings area, Ayars & Ayars, Inc. was awarded the contract to erect four well houses and associated infrastructure. The printing never stopped. That’s amazing because Ayars & Ayars, Inc. scopes of this project included: demolition of an existing masonry wall, removing a section of the concrete floor, excavation and placement of 30” thick concrete footings to accommodate new printing technologies. This tilt-up provides a prime location in a rapidly expanding commercial district. Ayars & Ayars, Inc, scopes of work on this design-build project included: foundations, tilt-up erection, steel erection, concrete flat work and paving. Associated Builders & Contractors recognized this project with an “Excellence in Construction” award. It’s difficult to tell where the original brick structure ends and the new tilt-up addition begins in this commercial space. Utilizing the Scott Brick System to embed brick directly into the tilt-panels saved the customer time and money. Partnering with Gage County Economic Development, Southeast Community College and the City of Beatrice, Ayars & Ayars, Inc. built this incubator providing a readily available source of commercial space for new or expanding businesses. Ayars & Ayars, Inc. was selected by Barnet & Ramel to create additional manufacturing space to expedite the addition of an advanced computer system. Ayars & Ayars, Inc. was selected to engineer, cast, and erect the tilt-up wall panels at the Alamo Drafthouse in La Vista, NE. Tilt-up concrete construction allows owners to have the buildings they desire in a time-efficient and cost-effective manner. Ayars & Ayars, Inc. continues to impact the agricultural manufacturing market. Our commitment to safety and long history of pre-engineered building experience were key to our being awarded this exterior renovation projects. Ayars & Ayars, Inc. was pleased to re-purpose this former packing plant as an oncology research facility for Abraxis BioScience Inc. Our adherence to fast-track scheduling provided the Owner occupancy thirty calendar days after start of construction. Ayars & Ayars, Inc. was excited to be selected to work on our first project with Runza® to build their new conventional wood framed facility in Plattsmouth, Nebraska. This project utilized all areas of self-performed work, which allowed us to meet the specific needs of the customer. Our scope of work for the project included site work, concrete, masonry, metals and carpentry. Ayars & Ayars, Inc. is pleased to be partnering with Tri-Con to construct their new connecting link addition. This project is divided into two phases. The first phase includes selective demolition of existing asphalt and creating a new opening into the west building exterior wall to create access for the new connecting link. Zumbro River Brand chose Ayars & Ayars, Inc. again to complete thier project because they knew from past experiences we would be able to complete it on time and on budget. The facility was in need of an updated, much larger break room. Ayars & Ayars, Inc. is excited to announce that we have been awarded a project at Zumbro River Brand, Inc. Once our crews completed the demolition of the existing area we constructed a new mezzanine on top of a steel slab. >Ayars & Ayars Inc. built a conventional steel framed office building that is designed to exceed LEED silver certification. This building is located in Sabetha Kansas, and is approximately 23,000 square feet spread over two stories. Do you have a television in your home made by Sharp Electronics? It was assembled at this manufacturing facility. This project is another example of our partnership with The Frazier Company - an industry leader in warehouse rack storage systems. One of the many projects our Special Projects Group has completed in recent years at Schneider Electric’s Square D plant in Lincoln; this one is notable because it was completed between 5:00 pm on December 23 and 5:00 pm on January 1. Our prowess as a pre-engineered building erector and our vast experience in the agricultural sector made Ayars & Ayars, Inc. the best choice for the new Rayeman Elements, Inc. facility. Our scopes of work included: steel erection, siding, roofing, gutters and trims. Ayars & Ayars, Inc. was happy to announce that we were working with Pro-Pet LLC to add on to their existing facility. They chose Ayars & Ayars, Inc. because they were confident we would be able to stay on pace with the fast-tracked schedule that was required for this project. This expansive facility in Council Bluffs provides Omaha Standard with the amenities they require for their manufacturing operation. Moscow and Orlando but this attractive facility in Lincoln is Norland’s official home. Ayars & Ayars, Inc. is proud of our long-term relationship with MetalQuest Unlimited, Inc. In 1999, we were chosen to erect the original facility, we were invited back in 2004 to add additional manufacturing space and now we are pleased to return for a second addition. Ayars & Ayars, Inc. design-build solution for this growing enterprise was this attractive pre-engineered facility. Creative use of concrete, masonry and architectural panels add visual appeal; a sunroom provides an enhanced work environment for employees. The first phase in the project was to demo the existing space to make the existing facility ready for the second phase. The second phase involved a tenant finish for the ULINE sales team that included new office spaces, bathrooms, a kitchenette, and three new conference rooms. Highlighting Ayars & Ayars, Inc. project management skills and the efficiencies of our steel erection, concrete placement and masonry crews, this project was completed one month ahead of schedule. Manildra Group USA has been a premier supplier of vital wheat gluten and starch for 30 years. Ayars & Ayars, Inc. is happy to be assisting with a tilt-up concrete building that will help aid in making their manufacturing process even more efficient. Safely replacing a failing section of roof and its insulation without disrupting Lincoln Industries delicate metal finishing operations was the goal of this project. Kawasaki called upon Ayars & Ayars, Inc. to help design and build their new interior enclosure within their Lincoln facility with enough space to test for general quality control of their products. The need to combine two manufacturing facilities under one roof prompted ISCO to expand and renovate their Lincoln facility. Our design-build team created space for ISCO’s shipping, receiving, molding, machine shop, assembly, engineering, accounting, and sales departments as well as corporate office space. Highlighting our construction and scheduling capabilities, this 273,482 sq. ft. tilt-up facility was fully operational nine months after groundbreaking. Design-build facilitated the erection of the building’s shell while final interior layouts were still in progress. Ayars & Ayars, Inc. was pleased to be selected construction manager for our third major addition to the Hughes Brothers facility. Our steel erection crew was also selected to erect the pre-engineered building. Ayars & Ayars, Inc. is a seasoned veteran when it comes to completing projects on the Hughes Brothers campus in Seward, Nebraska. Once again we partnered with them on a Design/Build project to construct a brand new 20,000 sq. ft. warehouse building that added much needed storage space for the company. When Hughes Brothers needed to expand and modernize their galvanizing operation, Ayars & Ayars, Inc. was pleased to provide this design-build solution. After 81 years in business in the same building, the 3rd generation of Hughes Brothers, decided it was time to update the look, feel, and efficiency of their offices. Having worked with Ayars & Ayars, Inc. before, their choice of contractor was easy. This is our fifth project in the last three years for Hughes Brothers. We are designing and constructing a new Shipping & Receiving building for them. Much of Ayars & Ayars, Inc. workload is generated by return clients with whom we have successfully partnered. We are proud of our relationship with Hughes Brothers and honored by the portfolio of projects with which we have been entrusted. Ayars & Ayars, Inc. is proud to announce our partnership with HOBO, Inc. We completed an interior remodel that includes fresh new updates like new cabinets, paint, and new plumbing. We also installed new walls, new doors, and an exterior metal staircase. The remodel created a great new environment and helped add to the continued success of HOBO, Inc.
Ayars & Ayars, Inc. is proud to announce that we once again worked with HOBO, Inc. We completed an interior remodel that includes two warm rooms that will allow HOBO, Inc. to melt and mix materials. We also installed two electric heaters in each room. This remodel will assist in speeding up production/mixing and add to the continued success of HOBO, Inc.
Ayars & Ayars, Inc. was pleased to be selected design-builder of Heller Casings new manufacturing facility. In addition to corporate offices, the building features a 6,000 lbs. overhead crane and a mezzanine. Our scopes of work included: design services, site development, building erection, concrete placement and interior finishes. Ayars & Ayars, Inc. counts Geist Manufacturing as one of our first projects 20 years ago; through the years, we’ve completed many projects for the Geist corporate family. Another example of our partnership with Geist Manufacturing, this masonry addition added additional room facilitating better work flow for the office support staff. Geist Manufacturing was one of the first to establish Ayars & Ayars, Inc. as their contractor of choice. Through the years, our respective businesses have partnered on many projects - the latest being this warehouse addition. Enclosing this 74,000 sq. ft. tilt-up building required 130 concrete panels; once casting was complete the panels required just 5 days to erect. Ayars & Ayars, Inc. has been building lasting relationships for over 30 years and continues to do so today. Garner Industries is a prime example of one of those great connections. After partnering with us in 2001 to build their current facility, Garner knew who to choose when it was time to expand again. 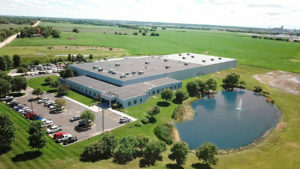 Ayars & Ayars, Inc. was pleased to be selected to expand and enhance the manufacturing capabilities of Extru-Tech, Inc.
Ayars & Ayars, Inc. completed an addition to Extru-Tech’s existing manufacturing facility in Sabetha, Kansas. The 14,900 sq. ft. tilt-up facility will mainly be used as office space for Extru-Tech employees. To meet the demand for their product, Dupont’s Circleville facility undertook a major facility upgrade. Ayars & Ayars, Inc. was selected to erect seven pre-engineered metal buildings ranging from 500 to 35,000 sq. ft.
Re-purposing available floor space and relocating CON-E-CO’s machine shop was the goal of this design-build project. Ayars & Ayars, Inc’s commitment to process-driven construction assures that regardless of the job size, every project receives the same level of craftsmanship and support. Once the new machine shop project was completed, it was time to enlarge and convert the vacated space into a state of the art paint booth. The expanding role of tilt-up construction convinced Composite Technologies Corporation, developers of the Thermomass Insulation System, to showcase its operation in this unique facility. Incorporating offices, manufacturing, and distribution, the facility features an in-floor radiant heat system and was designed to accommodate future expansion. This expansive facility is headquarters for Champion Homes, a leader in mobile and modular home production. Raw materials stage on a rail track system at one end of the building and emerge on the other end approximately one day later, ready for transport to the customer’s chosen location. Ayars & Ayars, Inc. was called upon when Central Lumber Sales was in need of more warehouse and manufacturing space. We constructed a Butler® Pre-Engineered Metal Building addition that not only added extra space but also overcame a big challenge by re-configuring one area of the existing roof to create an overall gabled roof over the entire building. Ayars & Ayars, Inc. was honored to be selected for work at the Caterpillar facility in Brooklyn Park. Ayars & Ayars, Inc. is pleased to have been selected design-builder for this expansion of C.J. Foods Pawnee City facility. The pre-engineered metal building addition enabled C.J. Foods. to expand their position as a custom contract manufacturing service provider for the Super Premium Pet Food industry. Ayars & Ayars, Inc. began its second project with BHJ USA, Inc. who continues to impact the pet food industry. The 55,000 sq. ft. facility will serve as a protein ingredient manufacturing plant supplying protein to the pet food industry. Ayars & Ayars, Inc. continues to impact the pet food industry. This multi-phased, design-build project for BHJ USA, Inc. renovates the existing break room, removes the existing office space and adds a new, larger office addition. Addax manufactures carbon fiber rollers for a wide range of machinery. This new facility provides additional manufacturing space to meet their customer's needs. Included in the plan for this new facility are designated areas for engineering, conference rooms, break room, research & development, and quality control in addition to an expansive manufacturing floor. We created a more efficient processing area utilizing Insulated Metal Panels (IMP) that will provide an easily controlled work environment and improve the ability to maintain cleanliness. The well-known pet food manufacturer, Blue Buffalo, partnered with AR Nebraska Investment, LLC, with Ayars & Ayars, Inc. as their Design/Builder. This pre-engineered metal addition serves as 160,000 sq. ft. of warehouse space for the ever-growing Blue Buffalo company in Bellevue, NE. Ayars & Ayars, Inc. believes nothing sells work like work. Zumbro River Brands (ZRB) had previously awarded our Special Projects Group several smaller projects; the team’s performance persuaded ZRB to select us as design-builder for this addition. As a partner with Krause Anderson Construction, Ayars & Ayars, Inc. was part of a $110 million dollar construction project that added additional operating rooms, treatment facilities and a multi-story parking garage to Saint Elizabeth’s Hospital. Ayars & Ayars, Inc. is impacting the health care industry again. This new wood frame facility will provide urgent care in the York area. We were pleased to be selected for this exciting project that allowed us to showcase the diverse set of skills of our crews. When a fire significantly reduced the University of Nebraska Medical Center's standby power production capabilities, Ayars & Ayars, Inc. expertise in design-build construction allowed work to begin on a replacement structure almost immediately. Ayars & Ayars, Inc. was pleased to provide the masonry and concrete components for Tabitha's new senior living facility. Tabitha provides compassionate older adult care through rehabilitation, home care, hospice, meals on wheels, adult day services and elder living options. Ayars & Ayars, Inc’s reputation of construction excellence was the deciding factor for Saunders County. Highlighting the skills of our steel erection team; we were pleased to be selected steel erector for this full-service medical facility. Expanding the scope of their service to the disadvantaged, the facility’s second phase saw the addition of more examination offices and introduced pharmaceutical and mental health services. The first of its kind in Lincoln; People’s Health Center is especially geared to those individuals/families with limited resources or with other barriers to health care. Designed to be built in 2 phases, this building allocates space for medical and dental examination rooms, laboratory, radiology and staff offices. It is with great pleasure that we at Ayars & Ayars, Inc. once again partnered with Oxford Senior Living to construct new homes for future residents of the Dallas area. After our last few collaborations, they asked us to work our magic again! Ayars & Ayars, Inc. was once again chosen to complete a design/build project within Northgate Crossing on the North edge of Beatrice, NE. This time for Davita - Renal Treatment Centers. This 5,800 sq. ft. facility will include seven dialysis stations along with two home training rooms. Nebraska’s Vocational Rehabilitation and Assistive Technology Partnership assists the disabled to become gainfully employed and provides technical training that promotes greater independence in all facets of life. Ayars & Ayars, Inc. was pleased to be selected design-builder for this interior renovation. Ayars & Ayars, Inc. is pleased to partner with Oxford Senior Living on a series of upscale retirement and memory care facilities throughout the country. Ayars & Ayars, Inc. is pleased to partner with Oxford Glen on multiple retirement and memory care facilities throughout the country. Oxford Glen in Grand Prairie, Texas is designed with residents in three cozy houses surrounding a beautiful atrium and support center. Our second Oxford project is a memory care facility in Sachse, Texas. Oxford Glen is designed with residents in three pods surrounding an atrium and support center. Ayars & Ayars, Inc. worked with The Gables of Overland Park to construct an addition of 11,760 sq. ft. that is now attached to their existing facility. Prior to the building process, the existing parking lot was relocated. Aging Services provides a wide range of services and opportunities for Lincoln’s older adult population. This new administrative office space is located on the lobby level of the old bank in the historic Lincoln Building built in 1912. Ayars & Ayars, Inc. was awarded a $12 Million, 5 Year Indefinite Delivery, Indefinite Quantity (IDIQ) contract to provide Construction Management Services to the U.S. Army Corps of Engineers, Kansas City District. Ayars and Ayars, Inc. is building a new wood framed office building as well as a metal shop and storage building for the Upper Big Blue Natural Resource District, located in York, Nebraska. The main building will be 14,000 square feet while the shop and storage building will be 10,200 square feet. Ayars & Ayars, Inc. was selected to build this dormitory for the maximum security prison in Amarillo, Texas. Our steel erection crews completed the project in 30 calendar days. Ayars & Ayars, Inc. was pleased to be selected design-builder for this Southeast Rural Fire Station. Highlighting the abilities of our concrete and steel erection crews, our scopes of work included: foundations, concrete placement, steel erection, interior finishes, MEP, paving & landscaping. Having completed the original facility in 1996, Ayars & Ayars, Inc. was pleased to return to Southeast Rural Fire Station for this addition. Highlighting the abilities of our carpenters, steel erection and concrete crew, firefighters are now able to utilize a new training center, kitchen, and office. Funded by a grant from the U.S. Department of Energy’s BetterBuildings Program, the reEnergize Program is a collaborative effort between the cities of Omaha and Lincoln to build energy smart communities. Ayars & Ayars, Inc. is pleased to partner with Buffalo Spirit, LLC to construct this new transit facility for the Ponca Tribe of Nebraska. When complete, the building will provide offices, transit space and a storm shelter for the Tribe’s Norfolk Campus. Ayars & Ayars, Inc. is pleased to partner with Buffalo Spirit, LLC. on this educational trail for the Ponca Tribe of Nebraska. The project provides an opportunity for the Ponca people to come home, experience the elements and understand the Ponca culture with the Community Building property, the Niobrara River Valley, the Missouri River area and Grandmother Earth. Ayars & Ayars, Inc. is always a strong champion of smaller cities and towns across the country; the latest example is this Operations Center for the Oelwein, Iowa Police Department. Amenities of the new facility include: administrative offices, locker rooms, dispatch center, armory, conference and interrogation rooms. After three years of planning and coordination with Gage County Economic Development, the Beatrice Community Hospital and the City of Beatrice, Northgate Investment Company, LLC. and their partners have moved forward with plans for a multi-million dollar mixed usage development that when finished, will include the new Beatrice Community Hospital, residential, commercial, retail and industrial development components. Ayars & Ayars, Inc. was selected to erect this fuel cell maintenance facility for the Nebraska Air National Guard. Our process driven construction approach assured on-time project completion. Ayars & Ayars, Inc. was pleased to be selected to complete this major renovation to the NAVFAC facility in Omaha, Nebraska. Our scopes of work in the administration building included: HVAC upgrades, lighting and electrical improvements, roof replacement, paint, floor covering and building system enhancements. In an earlier life this building was a telephone switching office, this project created a home for the Lincoln Police Department’s Northeast Team. Another example of Ayars & Ayars, Inc’s partnership with Kelly Klosure, this facility serves as a medical calibration lab and medical equipment warehouse at the San Joaquin Distribution Depot. Ayars & Ayars, Inc. is pleased to be a preferred erector of Kelly Klosure pre-engineered, pre-fabricated buildings. Through our partnership with Kelly Klosure, we have erected structures throughout the United States; most often located on military bases such as this building at Picatinny Arsenal - home of the US Army Armament Research, Development and Engineering Center. Ayars & Ayars, Inc. was pleased to be selected to erect these six structures in partnership with Kelly Klosure. As a preferred erector of Kelly Klosure buildings, we have completed projects across the United States - some of these locations include: Harpers Ferry, West Virginia, Colorado Springs, Colorado, Fort Calhoun, Nebraska and Turkey Point, Florida. Increasing recreational opportunities, adding accessibility and protecting the environment are the goals of the Independence Landing project. Our scopes of work on this design-build project include: pond and shoreline restoration, pier construction, landscaping, trail development and signage. This new Homestead Heritage Center endeavors to share with the public the national aspects of the Homestead Act of 1862 and its effects on the people, land, and world. The center houses a museum, curatorial storage area and serves as repository for the Homestead land-entry case files. Our Special Projects Group was pleased to enhance the ambiance in Lincoln’s Historic Haymarket by installing this clock. Ayars & Ayars, Inc. created Special Projects Group (SPG) to be a rapid response team; specializing in building improvements, facility maintenance, and projects of smaller scope. A masonry facade, canopies, and an aluminum storefront entryway begin to re-define the limits of what a pre-engineered metal building can become. A mezzanine over the office area services the eight bays housing fire trucks and emergency vehicles. The U.S. General Services Administration (GSA) leverages the buying power of the federal government to acquire the best value for taxpayers and federal agencies. Our work is complete on this new maintenance facility at Fort Riley. Highlighting the skills and abilities of our masons and concrete crews; the team’s scopes of work included: foundations, concrete flat-work, and masonry. Ready to begin a lifetime of service to our military, this maintenance facility will support some of the equipment that helps keep our country safe. Ayars & Ayars, Inc. is pleased that the United States Army recognizes the benefits of design-build and self-performance. We believe these methods are the best assurance of quality workmanship and on time/on budget project completion. Ayars & Ayars, Inc was pleased to be selected as part of the design-build team for the new Brigade Headquarters as well as three other facilities at Fort Riley. Utilizing design-build allowed work to begin on the building shell while interior finishes are finalized. Ayars & Ayars, Inc. stood ready to answer the Army’s call for a new facility at Fort Leavenworth. Our commitment to self-performance ensured quality workmanship and adherence to schedule. Our team’s scopes of work included: foundations, cast-in-place concrete walls, concrete flat-work, and masonry work. Adding functionality while decreasing energy costs were the goals of this design-build project. Kitchen, pantry, walk-in cooler, storage area, restrooms, and an office were relocated to the new addition, re-purposing the original building as a large exhibition hall. The opening of this station will provide enhanced fire protection and emergency medical services to the residents of the Elkhorn Suburban Fire District and the City of Omaha. This design-build facility houses an engine company, water tanker, and rescue squad. In 2004, Ayars & Ayars, Inc. was selected to erect a shooting platform to enable security guards at NPPD’s Cooper Nuclear plant to practice their marksmanship. This project enclosed the shooting tower, making it better suited to all season training. This pre-engineered metal office building provides Cooper Nuclear a controlled point of access to the reactor facility. The masonry exterior provides an extra level of security. Re-purposing a former “big box” retail outlet into a hub for serving the area‘s less fortunate was the goal of this design-build project. Carnegie Library, listed on the National Registry of Historic Places, is now the hub of economic development for Gage County thanks to the efforts of Ayars & Ayars, Inc. Challenges we will successfully overcome during the completion of this project include: upgrading the structural envelope and energy efficiency of the building without diminishing it’s historic significance and ensuring accessibility and creating state of the art office space for 3 separate agencies. It was a change of pace for Ayars & Ayars, Inc. to be involved in this type of project but the results show we helped place a safe and secure pedestrian walkway across a busy street. The Marice Exterior Remodel, is a prime example of the remodels we at Ayars & Ayars, Inc. have expertly completed and are skillfully experienced to complete. Ayars & Ayars, Inc. was called upon when the VanDorn Plaza was in need of an updated facelift. This facade remodels included removal and re-use of existing metal panels and sign installation for Planet Fitness and Westlake Hardware on the rebuilt facade. Based on the success of the initial phase of this project, Ayars & Ayars, Inc. was pleased to be selected design-builder of Valley View Village’s third building. Situated on the periphery of a major retail complex, this development blends contemporary design, superior craftsmanship, and excellent amenities into an ideal location for smaller retail and professional offices. Increasing the amount of day-lighting and reducing dependence on interior lights were the goals of this energy efficiency project for Determan Brownie, Inc. Studies show exposure to natural light increases employee productivity. This 2 story apartment building features 8 - 2 bedroom apartments. Brick veneer highlights the building’s exterior. Federal Express Ground’s new regional distribution center receives packages from other centers located throughout the country. Once unloaded, boxes are sorted and reloaded onto trucks and vans for customer delivery. Ayars & Ayars, Inc was excited to be selected by Ferguson to complete another showroom remodel, this time at their existing showroom in Omaha, Nebraska. The remodel included updates to their break-room, bathrooms, office spaces, conference spaces, and showroom area. Floors, Inc. is one of Nebraska's largest commercial floor covering sales and installation companies. Ayars & Ayars, Inc. was pleased to be selected design-builder of this facility. Force America’s site in Burnsville, Minnesota had a hill behind their building that needed stabilizing. After the first contractor was unable to complete the job, Ayars & Ayars, Inc. was called to fix the problem. Ready to provide some lucky tenant with a new home, this “warm vanilla box” requires only the appropriate interior finishes to match the demands of businesses seeking warehouse or commercial space. Ayars & Ayars, Inc. enhanced the front facade of this pre-engineered metal building with an architectural canopy, highlighting the work of our masons and metals specialists. Once inside the office, brick continues to be a major design element; culminating in Jay Tschetter’s unique brick depiction of General Excavating. The exterior design of this unique facility is based on reoccurring diamond patterns; this motif continues on into the building’s entryway. Exposing the structural steel and ductwork adds to the contemporary feel of the interior. Ayars & Ayars, Inc. was pleased to be selected as design-builder of Great Plains Auto Body’s second location. Finished in the company’s signature red and white color scheme, the facility features a state-of-the-art paint booth, eight vehicle repair bays offices, and a customer lounge. Hamilton Telecommunications and Ayars & Ayars Inc. have teamed up to complete a four-phase design/build project. One of which included creating a new parking lot and the other, a new structure to accommodate Hamilton’s daily operations. This new tilt structure will have plenty of open workspace, room for 20 offices and over 50 cubicles for Hamilton employees. Insulated Concrete Forms (ICFs) were the answer for this professional building. ICFs offer a variety of advantages including: durability, thermal insulation, sound dampening and resistance to pests and mold. Prominently positioned in a major retail location, this development blends contemporary design, superior craftsmanship and excellent amenities into an ideal location for smaller retail and professional offices. With the opening of this facility, Manhattan has a new source for it’s agricultural supplies. This design-build project features masonry construction and finishes typically associated with Tractor Supply. A part of a new retail development on Highway 370 just south of Omaha, this tilt-up concrete structure is home to a new Gordmans. Tilt-up buildings combine versatility and durability making them an increasingly popular option with retail developers. This addition to Schrier Ford - Mazda provides additional service bays and a detail shop for the rapidly expanding service department. Ayars & Ayars, Inc. scopes of work on this design-build project included: foundations, steel erection, concrete flat work, interior finishes and paving. Our Special Projects Group was pleased to be selected to renovate and conserve the historic Rixstine Recognition building. The streetscape will be enhanced with stone accents and an upgraded entrance while the remainder of the building is finished in an attractive earth-tone with blue and white trims. Ayars & Ayars, Inc. was called upon again to partner up with Rod Kush. This time it was to design and build a new 32,000 sq. ft. warehouse addition and loading dock to the allow more storage for the existing Kush 7 Day Furniture store in Omaha, Nebraska. This Butler pre-engineered metal building stands 160’ x 200’. Ayars & Ayars, Inc.’s Special Projects Group was quick to respond when Polar Parts, in Savage, MN, called and was in need of a remodel at their office. The existing office area was positioned within their shop space, which made working conditions loud, dusty and often times unpleasant due to temperatures during the summer and winter months. Fareway is an established grocery store chain headquartered in Iowa with locations throughout Iowa and Missouri. Ayars & Ayars, Inc. is proud to have been selected to build Fareway’s first store in Nebraska. The Fareway chain has become an early innovator in green technology by utilizing passive heating and air conditioning systems for their stores. Kincaid Home Furnishings offers finely crafted, genuine solid wood furniture and custom upholstery. After a fire ravaged their existing facility, Ayars & Ayars, Inc. was chosen to erect Kincaid’s new home. This project utilized a blighted designation to create new retail opportunities for area merchants. The architectural canopy utilizes EIFS, masonry and architectural roof panels to create a lighted, protective overhang. Our scopes of work included: site development, foundations, steel erection, exterior finishes, and paving. Here’s proof that innovative design and construction excellence can combine to blend the value of a pre-engineered metal building with style and refinement. The molding and cornice pieces add a splash of elegance to the brick exterior, allowing this facility to blend seamlessly into the historic neighborhood. Ayars & Ayars, Inc. tilt-up expertise was put to good use during the construction of this new Gander Mountain store. Highlighting the abilities of our tilt-up and steel erection crews, our scopes of work included: forming, pouring and erecting tilt-up walls and steel erection. A new chain of convenience stores has sprung up in the metro area. We are pleased to be selected as design-builder for the first of what the ownership of Eddy’s Convenience Stores believes will be several locations. Ayars & Ayars, Inc. was pleased to serve as construction manager for this retail center. While our preferred project delivery vehicle is design-build, our focus is always on what is best for our clients. Schedule a visit with our knowledgeable sales staff to discuss how we can help turn your vision into reality. liquor along with traditional grocery items. Ayars & Ayars, Inc. design-build services were the answer for Mardock Motor’s new facility in Crete. Our scopes of work on this project included: foundations, concrete placement, steel erection, interior finishes, MEP and paving. Our work at Kush Plaza began in 1997 with a renovation of an existing facility. As the Kush empire expanded, Ayars & Ayars, Inc. was chosen to erect a new warehouse, renovate spaces for additional retail outlets and an eating establishment and creation of a children’s furniture outlet. Re-purposing an existing warehouse facility into a new retail space was this project’s goal. Exterior enhancements include a new, inviting front entrance, sidewalks and parking spaces. Interior renovation features include: spacious showroom, sales offices and a warehouse. Ayars & Ayars, Inc. was pleased to be selected design-builder for Jet Splash Car Wash. Building amenities include a “touchless” car wash tunnel, detailing bays, offices, and a customer lounge. Jet Splash’s fourth location features an insulated concrete form (ICF) system designed especially for car washes. This system consists of rigid extruded polymer components that serve as the finished form-work for a variety of concrete walls including bearing, non-bearing, retaining, and foundation wall applications. Ayars & Ayars, Inc. first tilt-up concrete job and our first tilt-up addition! In 2001 Ayars & Ayars, Inc. erected a automotive detail facility and in 2003 an addition to the detail shop housed a new 185 ft long “touch-less” car wash bay and offices for the entire operation. Ayars & Ayars, Inc. was pleased to be design-builder for the House of Fabrics new facility. Incorporating the large parapet wall into the building’s design provides excellent visibility for signage and shields customers from the weather as they enter the facility. Hickman, NE. The Butler® Pre-Engineered Metal Building includes 4 storefront windows, an illuminated sign, and stone veneer to provide an aesthetically pleasing look to the front of the building. Who would have believed a pre-engineered building look like this? This storefront renovation for Frontier Harley-Davidson included a new cedar facade featuring a canopy, parapet walls, and a boardwalk entrance. Period doors and windows complete the “old west” look on this award-winning project. An existing structure was demolished to make way for the future of Firestone Automotive Centers in downtown Lincoln. 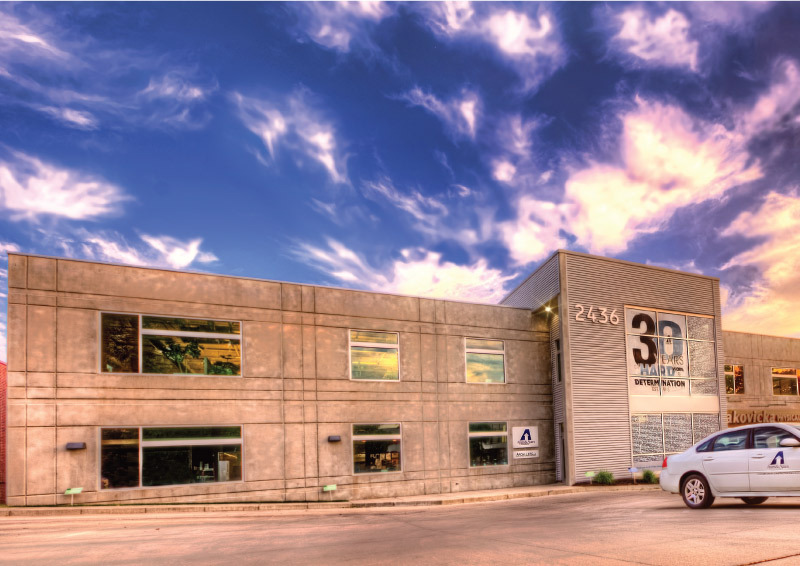 The facility features five service bays with trench drains, office space, and showroom finishes. Ayars & Ayars Inc. partnered up with Ferguson to remodel their plumbing and lighting showroom in Sioux Falls, SD. We gladly welcomed the chance to be able to create the new face for their branch. Our scope of work included the installation of new windows, full glass doors, plumbing fixtures, HVAC, and flooring. This is our third store for Fareway in the Omaha - Council Bluffs region. Fareway has more than 90 grocery stores located throughout Nebraska, Iowa and Missouri. Helping Lincoln keep its cars clean is the goal of this car-wash. As part of a large retail development, the free-standing car-wash is designed to reflect the surrounding architecture and features two “touch-less” wash bays and a central mechanical room. Brick and EIFS enhance the front façade of this downtown Lincoln development, but at its heart lies a pre-engineered building. Modern pre-engineered buildings combine efficiency and flexibility making them ideally suited for many types of projects. Located at 72nd & Harrison Street in LaVista, this convenience store is built of concrete block and Flexicore. It is the first store of many more to come. Keep your eyes out for those red, white, and blue signs! Developers are discovering that tilt-up construction is a cost-effective, durable and versatile solution for retail development. Ayars & Ayars, Inc, a pioneer of tilt-up construction, was pleased to be chosen as the builder’s shell subcontractor for this multi-tenant facility. Ayars & Ayars, Inc. was pleased to be design-builder for Waverly's newest retail facility. Construction began on this conventionally constructed building in October of 2007 and the building shell competed early April 2008. The development’s first tenant is already open for business and plans are underway for two of the remaining spaces. All Makes Office Equipment stayed open during this remodel of their existing building. The project is highlighted on the interior by the exposed steel trusses and duct-work, which work together for a unique look in the showroom. Starbucks - 33rd & O St.
Ayars & Ayars, Inc. demonstrates the next advancement in tilt-up concrete design. The exterior panels on this project combine the strength and durability of concrete with the latest advancements in foam technology to produce a hybrid tilt-up panel perfectly suited for this application. Clients of this law firm are greeted by a curved ceiling and natural light. Etched glass panels allow for confidentiality in the conference rooms while allowing natural light to filter into the lobby. The floor plan utilizes a circular office with attorney offices around the perimeter and support staff in the center. Ayars & Ayars, Inc. was pleased to be selected for this laundry room renovation. Our scopes of work included: demolition, carpentry, finishes, electrical and plumbing. Following our work for the Landlord at Van Dorn Plaza, Westlake Hardware hired Ayars & Ayars, Inc. to provide their tenant build-out using our Design-Build delivery method. Presented with a very tight schedule, the project team was able to successfully provide a complete tenant finish package, from polished concrete floors to new LED light fixtures and HVAC systems. Ayars & Ayars, Inc. was pleased to re-purpose a darkened retail outlet at Westfield Shoppingtown into The Market. The project features wood plank floors display shelves and an entry highlighted by Colonial-style moldings and trims. Ayars & Ayars, Inc. was excited to be part of The Bridge Behavioral Health renovation at the Lincoln center. The renovation included work on all three levels of the recovery facility, and added a much needed kitchen to the site. Ayars & Ayars, In. made changes to two rooms at the SpartanNash Banana Room. The scopes of work included priming, drywall, doors, carpets, heating, air condition, and more. The 1,700 square foot addition is perfect for the Banana Room. Highlighting the abilities of Ayars & Ayars, Inc’s Special Projects Group, the goal of this project was to remodel this space into what is now a healthy foods store. Scopes of work included: Furnishing and installing walls, flooring, cabinets and counter tops, lighting, and painting walls. Ruth & Mueller, LLC is a premier Nebraska lobbying firm providing complete state government representation to a wide range of clients since 1974. This project was a collaborative effort between Office Interior & Design and Ayars & Ayars, Inc. to provide a turnkey renovation of their existing office space by providing design, construction, and furnishings. Highlighting the abilities of our Special Projects Group, our scopes of work for Quick Connect included: demolition, framing, wall coverings, paint, floor coverings, finish carpentry and cabinet installation. Special Projects Group was created by Ayars & Ayars, Inc. specifically for smaller projects and commercial/industrial maintenance. The goal of this project was to create a “home” for Pinnacle Wealth Management, the personal investment branch of Pinnacle Bank. Our scopes of work included demolition, framing, wall coverings, ceilings, floor coverings, paint, finish carpentry and furnishings. Curved walls and specialty lighting were utilized to enhance the extraordinary finishes applied to this space. Features of this interior renovation include display areas, a break room, and offices. existing swimming pool that was filled in to create additional floor space. Ayars & Ayars, Inc. was pleased to be selected design-builder of Nebraska Occupational Health Center’s new home. Located in our award-winning Northview Centre project, our scopes of work included: framing, wall coverings, floor coverings, paint, doors and hardware, finish carpentry and equipment installation. Ayars & Ayars, Inc. is extremely proud of the work we did on our Mechanical Sales project. The Owner had a very specific vision for the building and we were glad to help make the dream a reality! The interior redesign and renovations to the basic office building have transformed it into a state of the art sales and engineering office. Ayars & Ayars Inc. was happy to finally welcome their new neighbors, Makovicka Physical Therapy, and help them settle into their new home. This tenant finish consisted of a complete revamp of the entire space. What once was a yogurt shop, is now a physical therapy office where patients can go to begin the process of healing. After Ayars & Ayars, Inc. completed Makovicka’s last tenant finish project at 48ROCK in Lincoln, there was no question who would be at the top of the list to call when it was time to open another office. Our crews completed the company’s 11th location at 70th & O St. in Lincoln, NE. This 2,000 sq. ft. tenant finish is complete with treatment rooms, a reception and waiting area, office space to maximize organization, and an open exercise area for patients to utilize. Ayars & Ayars, Inc. was pleased to assist with the launch of Lincoln’s second television station. Our scopes of work on this project included: creating the broadcast studio, control room and staff offices. Ayars & Ayars, Inc. is no stranger when it comes to working with chiropractic professionals, so when Invigorate Chiropractic selected us to help them create their own practice we knew we could do the job and do it well. This project includes a complete office build-out including framing, drywall, a suspended ceiling, electrical, plumbing, and an HVAC system. High Gear supports a community in motion and thanks to Ayars & Ayars, Inc. they now have a facility that enables them to better serve the cycling population of the Omaha/Council Bluffs area. High Gear’s philosophy states “Don’t worry, when it comes to having fun, we know our stuff. Ayars & Ayars, Inc. believes that then it comes to construction, we know our stuff as well. Ayars & Ayars, Inc. was selected to transform an existing banking outlet into First Federal Lincoln’s prototype bank of the future. Highlighting the abilities of our carpentry crew, this project features extensive cabinetry and trim. Architectural columns welcome patrons to a waiting area. Ayars & Ayars, Inc. was pleased to assist Experian to reconfigure their Lincoln facility to better serve clients and employees. Our scopes of work included: demolition, framing, wall coverings, painting, finish carpentry, floor coverings, office furniture installation and MEP. Maintaining a professional working environment for the staff of Keating O’Gara while renovations were underway was the challenge Ayars & Ayars, Inc. overcame on this project. Staging construction in phases, communication, and organizing activities around the law firm’s schedule enabled work to proceed without major disruption. This modern call center is home to Dr. Leonard’s Healthcare and Carol Wright Gifts. The open floor plan provides accommodations for up to 60 representatives and the technical resources necessary to an operation of this size. Other amenities include an employee lounge and manager offices. Ayars & Ayars, Inc. is pleased to submit another example of our partnership with the University of Nebraska. Digital IMS’ new home inside 1 Technology Place, our design-build facility on the Tech Park campus, demonstrates the versatility of tilt-up construction with regard to tenant finishes. Our customer-driven construction solution for Digital IMS used simple, high impact materials to produce bright, new-age finishes that reflect the company’s mission. Ayars & Ayars, Inc. was pleased to create Data Security’s new home inside the Lau Building in Lincoln’s Historic Haymarket District. Two of the main challenges we successfully overcame on this project were: removal of a section of railroad track and raising the roof to accommodate additional office space while maintaining the historical integrity of the building. Ayars & Ayars, Inc. was selected design/builder of Computer Services, Inc’s new home. Highlighting the abilities of our tilt-up concrete crew and our prowess in interior finish, CSI’s new facility is located in 1 Technology Place, a tilt-up facility we created for the University of Nebraska. Ayars & Ayars, Inc. was chosen to create the perfect sales environment for this; the newest Coldwell Banker location in Omaha. A warm, professional floor plan projects a sales environment conducive to the sales process. Mechanical Sales new office highlights Ayars & Ayars, Inc’s design-build prowess with high-end interior renovations. Amenities include spacious offices for sales and engineering staff, retail parts outlet, conference rooms, a professional kitchen and warehouse space. Bright colors, daylighting, open floor-plan and extensive use of glass enhance the work environment. Knowing that a customer’s first impression makes all the difference, Ameritas chose Ayars & Ayars, Inc. for their tenant finish. An enhanced, professional work space was created by incorporating an open floor plan and a client friendly service center. Ayars & Ayars, Inc. was pleased that American HomePatient chose our Special Projects Group (SPG) for this tenant finish. SPG was created to be a full-service construction team that specializes in smaller projects, repairs, and maintenance. Ayars & Ayars, Inc. was selected to facilitate the creation of additional work space to complement ACTON’s growing business. Utilizing design-build project delivery and fast-tracking the design allowed us to complete the project in 45 calendar days. Ayars & Ayars, Inc. was pleased to be selected steel erector for York’s new middle school. Our skilled workforce regularly self-performs in the areas of steel erection, carpentry, masonry, and concrete placement. Ayars & Ayars, Inc. is pleased to renew our long-standing relationship with York College; providing design-build assistance as they begin the transformation of the nearly 60-year-old Middlebrook Hall into an academic support center. This first phase of the project adds enhanced accessibility to the entire building with a new vestibule entrance and elevator addition. Another example of possibilities for design interest utilizing a pre-engineered metal building. Our scopes of work on this design-build project included: site develop-ment, foundations, building erection, concrete flatwork, masonry, interior finishes, MEP, asphalt paving and landscaping. Highlighting our Construction Management abilities, our enhancements to the overall educational environment in Wauneta Public Schools included: main office renovations, new locker rooms, improved athletic training facilities, concession stand, new connector link between two existing buildings and improved ADA compliance. Our Special Projects Group (SPG) has achieved “preferred concrete contractor” status with the University of Nebraska - Lincoln Campus. In this role, SPG is the University’s first choice for new and replacement concrete projects not directly associated with buildings currently under construction. This 14,000 sq. ft. addition allows for the Thayer Central Community School district to consolidate all of their satellite locations to one site. The addition includes eight classrooms, administration offices, computer lab / storm shelter, additional space to the existing Intermediate School building, as well as site work renovations to the south and east sides of the new building addition. Ayars & Ayars, Inc. faced the seemingly impossible task of completing Sterling Public School’s building addition and school renovation project in 18 weeks. The project schedule met the requirements for the students to occupy the new building for the fall semester of 2005. Ayars & Ayars, Inc. was chosen to implement a K-12 library addition for the Shelton Public School District. This library addition, classroom, and administration remodel created a central axis and focal point for the entry of the school. Two entries were developed to separate the elementary and secondary student body. Ayars & Ayars, Inc. was pleased to facilitate the installation of this multi-tiered retaining wall for Pawnee City Public Schools. Erecting the wall in two tiers serves to stabilize soil conditions around the existing athletic training facility and offers seating opportunities for spectators attending events at the track. The goal of this project was to enhance privacy without disrupting the existing office and lighting dynamics. Ayars & Ayars Inc’s Special Projects Group specializes in rapid response and cost-effective solutions for the minor modifications and repairs that make workflow more efficient. To help accommodate growth and the merger into Central Valley Elementary, Ayars & Ayars, Inc. began with the demolition of the 1920 3-story building to prepare for the construction of the new facility. Our design-build team then designed and constructed the new addition for elementary classrooms, remodeled the existing metal building into classrooms, and also constructed a brand-new bus barn. To accommodate a rapidly growing student population, Nebraska Evangelical Lutheran School faced a major facility upgrade; this addition more than triples the square footage of the original building. Amenities created in the new addition include; classrooms, enhanced library/media center, science labs, computer learning center, administrative offices. Ayars & Ayars, Inc. is pleased to have been selected to complete a renovation project for Nebraska City Public Schools. They will be moving from their current administration building to the newly renovated area to expand their day to day operations. The first part of this renovation included demolition of doors, walls, ceiling tiles and frames as needed. Our first tilt-up school project was in Lehigh, Florida. A Con/Steel Alliance member requested Ayars & Ayars, Inc. assistance with this new classroom building. Our scopes of work included wall panel layout/forming, pouring wall panels and panel/steel erection. Ayars & Ayars, Inc. is happy to announce that we have teamed up with Meridian Public Schools to design and build their new gym addition in Daykin, NE. This pre-engineered metal 8,200 sq. ft. gym addition will be a great resource for the growing K-12 school. By adding a second gym, Meridian Public Schools will gain much needed space to account for all of their current after-school programs. Design-Build construction proved to be the best option for this indoor air quality project for School District 70's facility. Students and staff will benefit from the enhanced learning environment provided by the 'California Loop' heat pump. Area taxpayers will be pleased by the reduction in costs associated with conditioning the facility's environment as well as additional savings realized through replacement of the original windows throughout the structure. Studies show a direct correlation between air quality and the learning experience. In our role as construction manager, Ayars & Ayars, Inc. was pleased to enhance the environment of Goodland High School with this indoor air quality project. Founded in 1905, Farmhouse Fraternity has long been considered at the top of the academic charts at UNL. When the fraternity elected to renovate it’s facility, Ayars & Ayars, Inc. value engineered a renovation that met the house needs and budget A building addition, new roof, fire suppression, kitchen, dining area, living room and improved sleeping quarters were the major highlights of this project. Ayars & Ayars, Inc. believes this is one of the first schools in Nebraska built using the design-build project delivery method. Dorchester voters determined the best way to provide quality education for their students was to demolish the original structure and replace it with an addition featuring both elementary and high school classrooms, multi-purpose room with stage, library and administrative offices. This new 10’ x 140’ skylight enhances the learning environment with daylighting and adds a warm, friendly atmosphere to the school’s offices, commons and dining room. Our scope of work also included upgrading exterior windows and doors throughout the facility. Enhancing the learning environment by creating additional classroom space was the goal of this design-build project. Scopes of work included: demolition, foundations, concrete flatwork, steel erection, masonry, interior finishes, MEP and landscaping. A new gymnasium entrance and additional storage space were the goals of this addition. Ayars & Ayars, Inc’s process driven construction ensures quality workmanship and timely completion - regardless of a project’s size. Ayars & Ayars, Inc. was pleased to be selected design-builder of this K-9 education wing to the Church of the Holy Spirit. Space was created for twelve classrooms, administrative offices, conference room, media center, kitchen, and a regulation size gym/performing arts center. New acoustic ceilings, improved lighting and a fresh coat of paint welcomed the students of Cedar Bluffs Elementary to the 2010 school year. Extensive HVAC modifications more efficiently circulate conditioned air - further enhancing the learning environment. A new ventilation/fire suppression system in the cafeteria kitchen improves everyone's health and safety. Auburn Public Schools is Nebraska's latest school district utilizing design/build to facilitate this tilt-up addition to Calvert Elementary School. Space was created for 10 new classrooms, new gymnasium, media center, rest rooms and mechanical/storage space. Ayars & Ayars, inc was pleased to be selected as design-builder of this 3 story addition to Bishop Neumann High School. Space was created for 6 classrooms, orchestra, industrial arts center, athletic locker rooms, and an elevator. The brick exterior was nearly an exact match to the original facility. Auburn Public Schools is Nebraska's latest school district utilizing design/build to facilitate this tilt-up addition to Auburn High School. Space was created for 7 new classrooms, restrooms, locker rooms, a multi-purpose/wrestling room, and a commons area. Auburn Public Schools was chosen as one of five school districts in Nebraska to receive a ‘School Greenhouse to Cafeteria’ grant during the 2016-2017 school year. Food grown in each greenhouse is harvested and used in their very own school cafeterias. Upon receiving this grant, Auburn Public Schools chose Ayars & Ayars, Inc. to design and build this structure with confidence after working with them on past projects. interior to better meet the demands placed on a modern worship facility while still reflecting building’s heritage. Highlighting the abilities of our masons, the goal of this project was to stop water infiltration into the tower roof and restore the integrity of the facility’s masonry. We believe self performance provides us with better control of project scheduling and sets the standard for quality workmanship. Ayars & Ayars, Inc. and Christ Community Church have teamed up once again to renovate a building on The Church’s campus, referred to as ‘The Porch’. The Church has worked with our Special Projects Group in the past and trusted we could deliver with our on time and on budget, high standard of quality once again. This remodel started with selective demolition of doors and fixtures, acoustical ceiling, sound/lighting booth, and the existing choir loft. The remodel included adding new carpet in the worship center and atrium, new acoustical ceiling in the worship center, and new screens in the atrium for a better viewing experience for all parishioners. Ayars & Ayars, Inc. was pleased to be selected to complete our first project with St. John the Baptist Church in Savage, Minnesota for a restroom remodel. Our scope of work included demolition of the existing restroom, installation of several doors, and various furnishings including: masonry, ceramic tile, plumbing, electrical and installation of bathroom accessories. The 68 foot 8 inch CMU structure features a brick facade, showcasing the work of our masonry crews. While the building will primarily serve as a bell tower for the Southern Heights Baptist Church of Lincoln, it will also house Verizon cell equipment. This will allow greater cell phone service to those in the area. Ayars & Ayars, Inc. Special Projects Group was awarded the Chapel Remodel at Salvation Army. Scopes of work include: removal of church pews, replacing the flooring and ceiling grid, remodeling bathroom, and replacing windows. This remodel brought new life to the chapel by giving it a fresh new look. Ayars & Ayars, Inc. was selected to help give the Salvation Army a face lift. The project included an interior remodel featuring freshly painted walls, updated restrooms, and new lighting. The metal building addition is complete with brick facade and will house their new food pantry. Ayars & Ayars, Inc. is excited to help bring new life to such an important community organization. Highlighting the abilities of our Special Projects Group, this interior renovation provides several enhancements to the overall worship experience. Scopes of work included: addition of a wheelchair lift to improve access to all three levels of the church, new pulpit with altar table in the chancel and installation of new cabinetry, woodwork, and door hardware in the narthex. The church bell was also refurbished. Our Special Projects Group was selected to upgrade and enhance the floor coverings, renovate the church pews and replace the glass between the Nave and the Narthex. Our scopes of work included: removal and refinishing of the church pews, carpet, vinyl and tile installation, re-install pews and glass installation. Our schedule phased the project in three stages, assuring the church would be able to continue it’s mission throughout the construction process. The goals of this design-build project were to enhance the appearance and correct the site elevations of Saint Mark’s courtyard. By redefining the square’s contours, Ayars & Ayars, Inc. was able to establish proper drainage and provide this beautiful entrance to the chapel. With Ayars & Ayars, Inc’s help, Saint Joseph’s Catholic Church is on it’s way to serving it’s parishioners well into the 21st century. Highlighting the skills of our masons, our scopes of work on this project included: tear off and replacement of the existing roof, replacement of the existing limestone parapet caps and landscaping. Demolition of the old church led the way to this impressive facility. Paying homage to the past, the stain glass windows from the old church were reconditioned and re-purposed in the new sanctuary. Additional amenities of the 660 seat church include a social hall, kitchen and staff offices. The River Heights Vineyard Church will have two main projects. The first project is a new addition that will feature a large stone fireplace and serve as a fellowship area for the congregation. Ayars & Ayars, Inc. will also remodel a classroom into a commercial kitchen space. This covered walkway leads to the garden area of a convent for cloistered nuns. It was designed to match the existing limestone building. The walkway is built with conventional wood framing and covered with an EIFS coating. The structure is protected with a standing seam, architectural panel roof. At the wishes of the residents no photos of his project were taken. Ayars & Ayars, Inc. was thrilled to be selected to design and build a multi-use gymnasium facilty for Our Lady of Guadalupe Seminary. The facilty will feature over 10,000 square feet of finished space for various activities. The building includes a basketball court, a weight and exercise area, and an elevated walking track. Ayars & Ayars, Inc. was excited to work with Osseo United Methodist Church to renovate their restrooms in their Osseo, Minnesota facility. The project started with the demolition of the restrooms existing floors, walls, ceiling and partitions. Then we installed new plumbing and replaced the concrete. Finally we added the final touches by installing plastic laminate counter tops and upper cabinets in each restroom. Ayars & Ayars, Inc. self performs many areas of our projects and it is because of our experience that we were selected for the exterior remodel at Oak Haven Church. The project included the demolition of the block walls, replacing the concrete sidewalk and stairs, and the installation of a new handrail. These changes helped enhance the exterior of the church while providing additional safety. Ayars & Ayars, Inc. was selected to erect the shell building for Northern Heights Baptist Church in Norfolk, Nebraska. The completed church will be 24,000 sf tilt-up structure that will include a sanctuary, entry way/commons, classrooms, offices, and a children’s area. Scopes of work included foundations, concrete, tilt-up walls using Lite Form® Insulating Concrete Forms, and erection of structural steel. Enhancing the church’s main entrance and providing better accessibility for it’s members were the goals of this addition. The stone siding from the original entrance was re-used, resulting in a nearly seamless transition between the old and new. Installation of an elevator ensures all worshipers to have unhindered access to church activities. Once again Ayars & Ayars, Inc. will be partnering up with Frazier Industrial on a project. This time they will be working for Lederle Labs in New York about a half hour north of New York City. Frazier Industrial set the rack system to fit the needs of Lederle Labs. Ayars & Ayars, Inc. provided the wall insulation, metal wall panels and trims. Ayars & Ayars, Inc. teamed up with Frazier Industrial on the completion of the 58,900 sq. ft. warehouse addition for IKO Pacific Shingle. Once the Frazier Industrial rack system was in place we provided wall insulation, metal wall panels, and trims for the structure. We completed this project in a short month and a half! To further enhance the worship experience, our Special Projects Group was selected to install new Stations of the Cross for Immaculate Conception Catholic Church. The major challenge overcome in successfully completing this project was providing structural backing for the 14 - 430 pound sculptures while maintaining the exposed surfaces of the 86 year old walls. Ayars & Ayars, Inc’s Special Projects Group was selected to install new doors, windows and millwork between the Nave and Narthex of Immaculate Conception. Creating casework that matched the “look and feel” of the existing sanctuary was critical to the success of this project. Ayars & Ayars, Inc. was honored to have been selected to build a new church in Farmington Minnesota. The new 8,967 sq. ft. structural building was built on five acres of land in Empire Township. The congregation had grown to about 70 members, and was in need of a larger space to worship. After being in the planning stages for the last four years, the church was finally ready to take the next big step in its growth. A pre-engineered metal building was the solution for First Presbyterian Church: using architectural panels on the roof contribute to the overall attractiveness and functionality of the building. The combination of a brick exterior and gable roof give the facility the look and feel of a traditional church and focuses attention on worship. Additional space was also created for offices and meeting rooms. Highlighting the abilities of our carpenters, masons, and concrete crew, this design/build renovation added functionality and enhanced the worship experience for members of First Lutheran Church. The South addition created space for a new chancel, apse, and sacristy. Originally built in the 1960’s, the demands of a growing congregation required Faith Lutheran to expand and renovate it’s facilities. The new addition creates space for a multi-purpose room, additional classrooms, full kitchen and staff offices. Energy conservation and an enhanced worship experience were the main motivation behind the renovation of this historic church. A geothermal HVAC system and other electrical and mechanical upgrades combined with new energy efficient windows will enable the congregation to reduce operating expenses. When Lincoln’s oldest Catholic cemetery chose Ayars & Ayars, Inc. to undertake a major expansion and renovation project, our construction solutions included: facilitating site improvements, relocating a second entrance, encompassing the entire cemetery with wrought iron fencing and enhancing the overall atmosphere with a comprehensive landscaping makeover. Transforming the ambiance of a 130 year- old building and creating a space that fulfills the spiritual needs of today’s parishioners was the goal of this design-build project. Although much of our scope of work was cosmetic in nature, the overall impact of the project produced a warm, friendly environment that is conducive to worship. Tilt-up concrete construction proved to be the best solution for providing Universal Logistics an energy efficient and low maintenance cold storage facility. Ayars & Ayars, Inc. scopes of work on this design/build facility included site development, foundations, concrete wall panels, steel erection, interior finishes, plumbing, electrical and mechanical. With the Lincoln market in need of quality warehouse and light industrial space, local developers tapped the expertise of Ayars & Ayars, Inc. to design and construct two new warehouses totaling 36,000 sq. ft. of space. These buildings feature clear-span Butler metal building systems with a blend of facade panels to meet both the requirements of the development association’s covenants while still meeting the developer’s budget needs. Site-work included dirt-work and paving that was completed in order to combat the issue of being located within a flood plain. Ayars & Ayars, Inc. and Greenleaf Properties together answered the call for more warehouse space in Lincoln! This Butler pre-engineered building will provide over 18,000 sq. ft. of warehousing space. A mirrored floor plan will enable this building to easily accommodate up to two users, each with a dock and drive-in access. Other features include 20’ of clear height without interior columns, providing more space for storage. 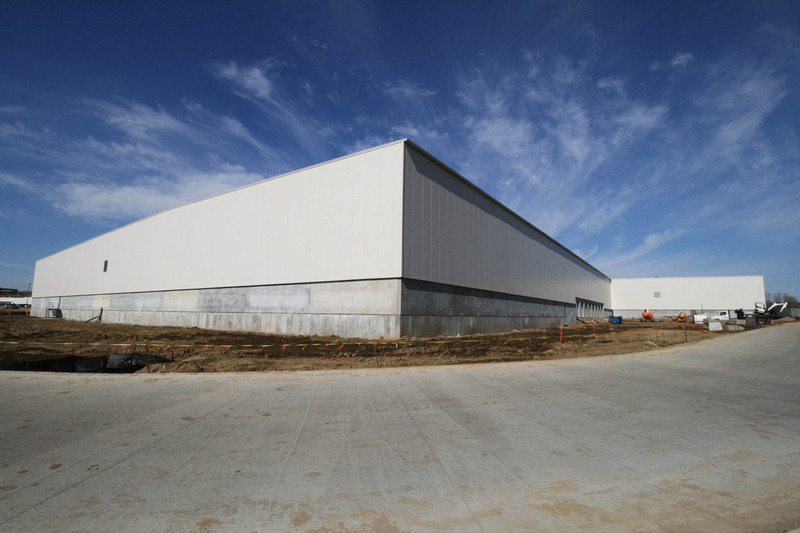 Facilitating improvements to the warehousing and shipping departments of Nestlé Purina Pet Care was the goal of this pre-engineered building addition. The structure features 20 loading docks designed to increase the number of product shipments while easing truck traffic congestion around the plant. Additionally, space was created for facility maintenance offices as well as a full sized trailer wash bay. Construction started in November 2007 and completed in July of 2008. Ayars & Ayars, Inc. was pleased to assist Nestlé Purina’s manufacturing process with this dry ingredient storage addition. By re-purposing the plant’s existing pre-cast panels in the design of the new addition, we were able to accelerate the project schedule and reduce project costs. Our scopes of work included: foundations, pre-cast erection, steel erection, interior finishes and paving. Ayars & Ayars, Inc. was pleased to be selected to erect this warehouse addition for Nestlé Purina. Our scopes of work included: structural modification of the existing facility, erecting a single story pre-cast concrete warehouse with pre-cast double tee roof units spanning 60 feet and utilizing structural steel and insulated panels to construct the new trash load-out structure. Historians of Ayars & Ayars, Inc. will immediately recognize a portion of this building as a project we completed in 1995. The new owner re-purposed this facility as a warehouse for their line of pet products but found that the original structure needed to be enlarged to meet their needs. Ayars & Ayars, Inc. is pleased to have been selected to erect this pre-engineered building addition for Nature’s Variety. After Lonsdale Packaging signed a new client that would require storage of products within their building, they knew it was time to partner with Ayars & Ayars, Inc. to complete a project to add 20,000 sq. ft. of storage space to their existing facility. This design/build project now provides that much-needed space that Lonsdale Packaging demands. This company will move your household across town, across the country or act as you personal storage closet. Warehouse and office space are combined in this facility on Cornhusker Highway. The addition of a mezzanine doubles the square footage of available office space and the exterior is highlighted with brick veneer and an architectural canopy. Ayars & Ayars, Inc. largest building in terms of square footage, this pre-engineered facility was completed in 90 calendar days. To accommodate the owner’s aggressive schedule, the roof framing was assembled in pods on the ground, and then lifted into place and attached to the main frame. This 6-story Pampers facility is another example of Ayars & Ayars, Inc. and Frazier Industrial partnering on a warehouse project. Frazier Industrial’s rack storage system doubles as the building’s structural component. Our scopes of work included insulated metal wall panels and trims. This system saves owners money because there is no need for additional structural members and maximum usage of the available floor space. After Lonsdale Packaging signed a new client that would require storage of products within their building, they knew it was time to partner with Ayars & Ayars, Inc. to complete a project to add 20,000 sq. ft. of storage space to their existing facility. This design/build project now provides that much needed space that Lonsdale Packaging demands. This facility is used as a dairy products distribution center to serve retail outlets. Approximately half of the building is a refrigerated dock area with interior insulated metal wall and ceiling panels. A small self-contained freezer room is provided for temporary storage of frozen dairy products. The remaining building areas consist of offices, support and equipment storage space. Continuing our long time relationship with Frazier Industrial Company, Ayars & Ayars, Inc. completed four projects, warehouses #51, #52, #53, and #54, over the span of two years on the Jack Daniel’s site! The four tall structures house the famous Jack Daniel’s whiskey as it ages inside oak barrels. Puerto Rico. Frazier Industrial is a leader in rack storage systems, on this project the rack storage doubles as the buildings structural component. Ayars & Ayars, Inc. scopes of work included insulated metal wall panels and trims. Ayars & Ayars, Inc. was pleased to be selected design-builder for this new pre-engineered facility. Amenities include: eight loading docks with dock levelers, two additional overhead doors and a 8,200 sq. ft. mezzanine. Our scopes of work included: site development, foundations, steel erection, concrete slab on grade and paving, masonry and MEP. Ayars & Ayars, Inc. has collaborated on several projects with Greenleaf Properties throughout Lincoln, NE. We constructed this original facility and were excited to be selected for the reroof project. The new Butlerib-II Roof System, which includes a moisture protection barrier, is installed on top of the existing roof. By placing the new roof system directly on top of the existing roof, it allows the building to remain operational while also speeding up the entire construction process. This pre-engineered metal building connects two existing airplane hangars currently used as warehouse space by Goodyear Tire & Rubber Company. To accommodate heavy forklift traffic, the concrete floor received a dry-shake coating that acts as an additional hardener to give the floor a harder finish surface. Ayars & Ayars, Inc. partnered with Frazier Industrial Company on the Armstrong World Industries new warehouse. Frazier Industrial first installed the rack structural system and we provided wall insulation, metal wall panels and trims. Ayars & Ayars, Inc. was pleased to collaborate with Cargill (also known as Provimi North America, Inc.) to complete upgrades to their current shipping and receiving warehouse in Fremont, Nebraska. Upgrades included removal of concrete to accommodate the plumbing for the new men’s and women’s locker rooms. A new shipping office, warehouse manager’s office, IT room, a breakroom (which also serves as a conference room), and a truckers only lounge and restroom were added. Ayars & Ayars, Inc. was pleased to be awarded the roofing contract on this Butler building. When a pre-engineered building is the construction solution, partnering our skilled workforce with a world class building supplier is our customer’s guarantee of a quality project. We are proud to be a certified Butler Builder®. This defined isle rack storage building is over 60 feet tall. The rack system by Frazier Industrial, provides the structural support for the building and is covered with wall panels and ballasted single ply roof membrane. This tenant finish included a bathroom renovation, a kitchen remodel, an overhead door replacement, and a new store front. Ayars & Ayars, Inc. partnered with WSM to provide design/build services for an addition and remodel to their facility in Omaha, NE. The addition includes 10” thick concrete floors reinforced with rebar to ensure strength to withstand the high volume forklift traffic. It is constructed using pre-engineered steel. We installed new lighting in the existing storefront and painted interior and exterior walls. Ayars & Ayars, Inc. has partnered with Vertical Limit to complete multiple projects. These projects include constructing various types of shelters to house the electrical panels that control the wireless towers built by Vertical Limit. The shelter construction type differ from one project to the next. We are proud of our large number of clients with whom we have completed multiple projects – Smithfield Foods is a prime example. This time we were called in to replace existing steel meat rail beams. Our scope of work included removing existing rail hangers and rails, and disposing of the existing steel beams in the processing areas. This two story office addition for Nestlé Purina represents our sixth major addition to the Crete campus. Our self-performed scopes of work include: demolition, foundations, cast-in-place concrete walls, concrete flat-work, steel erection, pre-cast concrete erection and interior finishes. These three additions enhance Nestlé Purina PetCare’s ability to produce high quality food for our pets. We are pleased that Nestlé Purina PetCare shares our focus on safety, schedule and quality as evidenced by our continual involvement in projects throughout the facility. Ayars & Ayars, Inc. and Nestlé Purina PetCare collaborated to expand Nestlé’s penthouse that is currently being used for storage in their Oklahoma City Warehouse. We added on to the existing penthouse by converting the current one-story warehouse into a two-story factory. Ayars & Ayars, Inc. was pleased to assist with MBA Poultry’s relocation to the new Waverly Industrial Park. Highlighting the abilities of our steel erection, masonry and concrete placement crews, our scopes of work on this project included: foundations, concrete placement, masonry, steel erection and precast concrete installation. One of the by-products of ethanol production is the food additive; gluten. Ayars & Ayars, Inc. was proud to be design-builder of Manildra Energy’s gluten production project. In addition to the gluten plant, we were also responsible for erecting storage silos and a load out facility; facilitating the transfer of the finished product for shipment via rail-car. Highlighting the abilities of our concrete crew, this multi-phased project placed foundations, cast-in-place walls and slabs-on-grade for 2 - 120’ diameter crude oil storage tanks and their associated infrastructure. With Ayars & Ayars, Inc. assistance, the new BridgeTex pipeline will streamline crude oil delivery. Ayars & Ayars, Inc. was happy to be selected as the subcontractor for general construction throughout the project at the LES Gray Water Cooling Station. Ayars & Ayars, Inc. provided the piping for the water supply, the wastewater pits, buildings, the meter vault, and the installation of a 4' x 20' curb with a removable top at the Water Supply Building. Ayars & Ayars, Inc. was again selected to perform a project for Johnson Controls. This specific one entailed surface prep and epoxy install to a tunnel to prevent slip hazards to employees. Ayars & Ayars, Inc. is committed to safety and was proud to complete this project. Ayars & Ayars, Inc. was selected to do a complete remodel of Johnson Controls Northern Hump Tower existing control center. Work done included building a 400 unit locker room, remodeled bathrooms, offices, break room and exterior storage. Johnson Controls came to Ayars & Ayars, Inc. for help with determining the source of a water main leak below the building slab. By highlighting the abilities of our concrete crew this project required excavation to remove and replace damaged sections of the mainline, along with concrete repair. If all the roof panels Ayars & Ayars, Inc. replaced on this project were laid end to end, they would span 54 miles. Beyond the plant re-roof, our scopes of work included purlin replacement over the rendering area, waterproofing 250 roof penetrations and installation of 150 roof curbs. Ayars & Ayars, Inc. continues to strengthen their relationship with Hughes Brothers. Back in 2013, we completed a project to add a 20,000 sq. ft. warehouse space to their campus. When Hughes Brothers ran out of space within this building and needed to expand, it was only natural they called us. Ayars & Ayars, Inc. was selected yet again to work with Hughes Brothers on a design/build project. This time constructing a new briquettes building located at their Seward, Nebraska campus. Our scope of work for this project included site work, concrete and metal erection. This state of the art waste water treatment facility includes four cast-in-place concrete treatment basins, pump house maintenance garage and space for offices and laboratories. Highlighting the project was the performance of our concrete crews; placing the 2,400 cubic yards foundation in under 12 hours. This unique project links Excel Corporation’s holding pens with the processing plant and represents the “last stand” for our bovine friends. Ayars & Ayars, Inc’s scopes of work on this design-build project included: foundations, steel erection, masonry, concrete flatwork and pre-cast erection. The next step in the continuing mechanical retrofits for the Excel Corporation, this pre-engineered metal building continued the work Ayars & Ayars, Inc. had begun in phases 1 and 2. Due to the size of the existing facility, it was impractical to use standard cranes for this building erection; the challenge was met using a helicopter to airlift and set the building’s main frames. An example of Ayars Ayars, Inc’s “value engineering” abilities, this pre-engineered metal building solved Excel Corporation’s need to retrofit their existing facility with new mechanical systems - without disrupting production. Designing the new building to take advantage of the existing structural framework assured the integrity of this unique project. This unique structure enables Excel to efficiently transfer meat from it’s production facility to a freezer facility across the highway. Ayars & Ayars, Inc. is proud of our large number of clients with whom we have completed multiple projects - Excel is a prime example. Special Projects Group is pleased to be Cook’s Ham, Inc’s preferred provider for facility maintenance and renovations. Our scopes of work have included: concrete floor repairs, cast-in-place concrete walls, door and hardware installation, wall panel installation, masonry, demolition, modifications and re-configurations. Ayars & Ayars, Inc. is proud of our large number of clients with whom we have completed multiple projects - Cargill is a prime example. BNSF and Ayars & Ayars Inc, have partnered up to design and build a mezzanine addition that will add much needed space for racking. We were chosen to complete the project because BNSF trusted we could get the project done on time and on budget. There was a certain amount of headroom that was required for the mezzanine that we had to account for during our design stages. BNSF and Ayars & Ayars Inc. partnered again and worked together to create a new storage facility for BNSF’s fuel trucks. The main purpose of these trucks is to transport fuel to BNSF stations in the area. This building will serve as a holding area for the fuel trucks during and after transportation jobs. Because BNSF and Ayars & Ayars, Inc. have worked on multiple projects together, it was an easy decision for them to choose us once again. This time it was to discuss extending their newest 15,000 sq. ft. parking lot at their Fridley, MN location. In a previous life this was the home of Wah-Taco. Ayars & Ayars, Inc. was chosen to re-purpose the structure as a Subway Sandwich Shop. Finished inside and out in the signature Subway yellow, Wahoo now has another option to satisfy it’s hunger. Ayars & Ayars, Inc. is well acquainted with Subway Restaurants; we have been selected as Design/Builder of three new stand-alone facilities and created an outlet inside an existing convenience store. Additionally, we are proud to have been selected to renovate the historic Wah-Taco in Wahoo for Subway. As the pace of our life quickens, the partnership between the fast food and the convenience store industry is becoming the norm. Ayars & Ayars, Inc. was pleased to be selected as design-builder for this facility; showcasing the work of our masons, carpenters and steel erection team. Once located in a kiosk in the middle of the shopping center, Rocky Mountain Chocolate factory re-located to this new storefront near the newly remodeled food court at Westfield Shoppingtown. Regardless of the square footage, Owners count on Ayars & Ayars, Inc. reputation for quality workmanship and on time/budget performance. Working closely with the owner’s design staff, the 4,660 square feet offers the neighborhood great food and refreshing beverages. The bistro includes 550 square feet of banquet space, 500 square feet of retail sales space, and access to outdoor dining space which includes a gas fireplace. The Bistro blends into the inviting, cohesive exterior facade/site improvements completed by Ayars & Ayars, Inc. to the Piedmont Shopping Center. Highlighting the abilities of our masons and steel erection team, this addition was Ayars & Ayars, Inc’s design-build solution for Pettit’s Pastries warehouse needs. Our scopes of work included: foundations, masonry, steel erection, door installation, MEP and paving. The second tenant of our 48ROCK building, Kelly’s Yogurt is the newest sensation in the University Place neighborhood. Our scopes of work on this project included: framing, wall coverings, polished concrete floors, finish carpentry and equipment installation. We wish our new neighbors luck with their new endeavor. Knowing that a customer's first impression makes all the difference, Jersey Mike’s selected Ayars & Ayars, Inc. to facilitate construction of this new sandwich shop. Our reputation for quality workmanship and on-time completion, so critical in this type of project, allowing the owner to focus on opening the door to new customers. >Jabrisco’s caters to those seeking an upscale yet casual dining experience. Designed around a wood fired pizza oven; open architecture and a unique paint scheme enhance patrons dining ambiance. Paying careful attention to the building’s historic design, the entire project was completed in accordance with Haymarket Historical Preservation guidelines. Need a place to watch the game? Heidelberg's supplies game-day ambiance combined with 20 high-definition televisions, great food and refreshing beverages for 330 of your closest friends. Ayars & Ayars, Inc. scopes of work on this design-build project included: site development, foundations, building erection, concrete flat-work, interior finishes, and MEP. Grisanti's Restaurant was ready for a new look and when they said they were ready - they meant now! The project schedule allocated 132 hours for completion. Demolition began on a Sunday at 4:00 a.m. and crews worked round the clock to meet the project's scheduled completion time of 4:00 p.m. Friday. Scopes of work on this project included: updating the carpet, changing the paint scheme, replacing the booths, installing a new tile floor in the kitchen, creating space for a new wait station and private dining area and installing new lighting throughout the dining areas. Wanting to capitalize on being named one of the 100 best Chinese restaurants in the Midwest, Dragon Cafe chose mid-town Omaha for it’s second location. Design- build facilitated rapid project development, allowing the owner to focus attention on their business while Ayars & Ayars, Inc. concentrated on construction details. The project’s biggest challenge involved design and installation a range hood capable of meeting the demands of wok-style cooking. We have recently completed an exterior renovation to the Dairy Queen in the heart of the University Place Neighborhood. The updated facade now features an eye catching brick wall and Dairy Queen’s signature colors, bringing new life to our favorite guilty pleasures. Ayars & Ayars, Inc. is happy to announce another partnership with Dairy Queen. Our exterior remodel included the resurfacing of the asphalt for the entire parking lot, new curbs, and replacing the concrete in the drive-thru lane. The additional parking and outdoor eating area are sure to be a hit with customers! Located in the historic Dundee area of Omaha, Noodle Zoo desired an eclectic atmosphere to match the diversity of their clientele. The eye-catching drop ceiling and the hand painted floor combine to provide a unique dining experience. Ayars & Ayars, Inc. scopes of work on this design-build project included: demolition, interior finishes, kitchen installation, MEP and paint. Re-purposing a vacant storefront in the historic Haymarket district was the goal of this design-build project. In addition to the unique design of the lounge, the restaurant boasts a full kitchen, generous dining facilities and private party rooms. Careful attention to the preservation of historical details as specified by the Haymarket Historical Preservation Standards was critical to the overall success of this project. ambiance for this 3,729 square foot masonry restaurant. Ayars & Ayars, Inc. scope of work on this design-build project included site development, foundations, building erection, concrete flat-work and MEP. Material delivery for this pre-engineered facility required 75 truck loads transporting 1,406 tons of steel. Design allocates 60,000 sf to airplane renovations, and features an overhead crane used to facilitate repairs. The remaining space provides homes for Duncan’s sheet metal, upholstery, cabinet, engineering and design divisions. To better serve the youth of Des Moines and surrounding communities, the Metro Ice Sports Facility in Urbandale, Iowa, has been enhanced with the addition of a second ice rink more locker rooms, spectator seating for 100, and concessions, in effect doubling the size of the facility. With the completion of this project in 2000 the expanded facility now has “twice the ice”. Ayars & Ayars, Inc. was excited to be selected to work with Bryant HVAC to build their new headquarters located in Lincoln, NE. The pre-engineered metal building will consist of a warehouse space, fabrication shop, and employee offices. The roof will utilize Butler's MR-24® Standing Seam Roof with an 80-foot clear-span. Ayars & Ayars, Inc. was pleased to be selected design-builder of this clubhouse for York Country Club. Amenities include an open floor plan that accommodates up to 275 guests or can be reconfigured for more intimate venues, dance floor, full kitchen, bar, pro shop, locker rooms and staff offices. The enormous popularity of the Lincoln Stars hockey program was the driving force behind this addition to the Ice Box; providing seating for an additional 792 fans and raising the capacity to 5,023. Other amenities include: a new press box for the Lincoln Stars radio broadcasts, an elevator for handicap accessibility, lounge, additional rest rooms, and a locker/weight room under the existing stage area. Ayars & Ayars, Inc. is excited to have been selected to complete a project in AntelopeValley in Lincoln, NE. The project consists of a mixed-use redevelopment of the entire block between K St. & L St. on Antelope Parkway. This four-story facility will be a mix of apartment space as well as commercial retail space. Ayars & Ayars, Inc. was the Owner’s preferred contractor to oversee the development of infrastructure improvements at Speedway Sporting Village in Lincoln, Nebraska. We were able to provide assistance and manage the development from the design phase through construction of the first phase of new utility services such as, water mains, sanitary sewer mains, storm sewer, site lighting, paving, walks & landscaping of the Sporting Village Complex. The Speedway Sporting Village is located in southwest Lincoln and the family-friendly destination features a large indoor soccer complex, 10 outdoor soccer fields and the Defy Gravity Trampoline Park. The pre-engineered metal building features 180 ft. clear span and Butler Manufaturing Sky Light System. Speedway Sporting Village is the hub of everything sports in Lincoln, NE. Ayars & Ayars, Inc. was excited to work with Speedway Properties again to finish their basketball / volleyball sports complex. The facility consists of eight basketball courts or 12 volleyball courts, and two collegiate sized courts are also possible. Speedway Sporting Village, located in southwest Lincoln, is a 76,000 sq. ft. facility which is destined to be indoor basketball and volleyball courts. This Butler Manufactured pre-engineered metal building features a 140 ft. clear span and a sky light system, which allows for ample amounts of light to illuminate the courts below. subpage-center-justified light">Where’s the best place to watch the Lincoln Stars? Ayars & Ayars, Inc. knows it’s the Sky Box. Equipped with everything you need to enjoy the game, the Sky Box is used to entertain corporate clients and is often donated to local charity auctions. Ayars and Ayars, Inc. was pleased to be part of the team that built one of the largest projects in the Lincoln’s recent history - the Pinnacle Bank Arena. Highlighting the abilities of our concrete crew, our scope of work focused on placing the ice rink. The monolithic pour began at 6:00 am and finishing operations were completed by 10:30 pm - a long day to be sure, but well worth the effort. Penner Sports Complex provides the citizens of Aurora another outlet to follow their recreational pursuits. The design-build facility features an open floor plan that provides ample space for two full-size basketball courts or four volleyball courts, bleachers and other amenities. Our scopes of work on this project included foundations, concrete flat-work, concrete tilt-wall, steel erection, masonry, and roofing. This multi-purpose facility at Mahoney State Park features an open air ice skating rink and space to warm up with a cup of coffee or spend time relaxing in the indoor fun center after the big hockey game. The building doubles as an activity center during the warmer months. Mahoney State Park Activity Center is a good example of the possibilities pre-engineered building technology has to offer. Ayars & Ayars, Inc. believes that after we completed this indoor practice facility, we are partially responsible for the success of the NFL’s Indianapolis Colts. This pre-engineered building features a 220 ft clear span, 50 ft eaves and a peak height of over 70 ft. Showcasing the abilities of our steel erection team, building erection was completed in 64 calendar days. This new Field House for York College features a raised running track. The brick facade that graces this metal building is a reflection of the other buildings on the York College Campus. Creative thinking and value engineering allowed Ayars & Ayars, Inc. to work through winter conditions, accelerating project completion by 30 days to facilitate the college’s desire to incorporate facility dedication into the springtime graduation ceremony. Scopes of work included foundations, steel erection, concrete flat work, masonry, interior finishes and MEP. When the approach aprons of the local swimming pool were failing, the City of Henderson chose Ayars & Ayars Special Projects Group to effect repairs. Special Projects Group specializes in rapid response and innovative execution of smaller projects; in this example ensuring the pool was open for the summer season and extending the life of a valuable community resource. Lincoln’s center for prep sports; Ethel Abbott Sports Complex is home to the Nebraska Volleyball Academy, the Nebraska Football Academy, Nebraska Rush Soccer Academy, Nebraska Tennis Academy and Cornhusker Shooting Stars (women’s basketball academy). The facility contains 2 full sized indoor soccer fields complete with artificial turf, 9 full sized basketball courts, locker rooms, concession stands, weight training facilities, bleachers and sports offices. Ayars & Ayars, Inc. was excited to help Defy Gravity make their dream a reality. The 34,281 sq. ft. facility is housed in the Speedway Sporting Village pre-engineered metal building. The indoor trampoline park features an impressive 67 ft. by 110 ft. trampoline for open jump sessions, dodge ball and fitness classes. Ayars & Ayars, Inc. was pleased to be selected to enhance the esthetics and safety of Dakotah! Sport and Fitness swimming pool. Our scopes of work included: demolition, resurfacing the pool deck, masonry finishes and safety railing installation. Ayars & Ayars, Inc. was chosen to replace the existing concrete stairway and retaining wall between the parking lot and club house of the Bracketts Crossing Country Club in Lakeville, Minnestoa. Our scopes of work included: demolition, concrete, carpentry and the construction of the retaining wall. Our construction allowed for temparary stairs so the country club could remain open during construction. Ayars & Ayars, Inc. once again partnered with Alamo Drafthouse to complete all of the concrete work for their theatre in Woodbury, Minnesota. Our portion of this 42,835 sq. ft. building includes: pouring foundations / floor slabs, and pouring / erection of tilt-up panels. The building’s walls will be cast on site, which accelerates the construction process while also reducing the transportation and handling costs. Ayars & Ayars, Inc. was excited to be selected by Little Feet Big Steps to build their first daycare. The 10,192 sq. ft. wood framed building consists of various rooms for children ranging from infants to pre-kindergarten age. One special feature included within this building is a hardened room that protects children from 200 mph wind speeds. This room ensures safety for all children present in the case of inclement weather. Our scope of work included a turnkey package. We provided site work, concrete, masonry, wood frame construction, finishes, and build out. When Linweld needed a new home for its corporate airplane, they chose Ayars & Ayars, Inc. Our scopes of work on this design-build project included: foundations, metal building erection, concrete flat work, and interior finishes. Building amenities include restrooms, conference room and a fire suppression system. Our scopes of work on this project included site development, footings, concrete flat work, poured concrete stem walls, pre-engineered building erection, interior finishes, MEP and landscaping. In addition to providing concrete products for the region, this ready mix plant provides raw material for Wahoo Concrete’s line of specialty flooring for the hog confinement industry. Our scopes of work on this design-build project included: foundations, batch plant erection, concrete flat work, metal building erection, utilities and interior finishes. Con-E-Co’s All Pro Ready Mix Plant was the right solution for this 140 cubic yard plant. Although two cement silos remain outside the building, one silo and 110 tons of aggregate are enclosed inside the pre-engineered facility. This ready mix concrete facility surrounds a Con-E-Co batch plant with a pre-engineered metal building. The 300 cubic yard per hour plant features a central mix plant, 4 cement silos and 250 tons of aggregate storage. Plant offices utilized Integrated Concrete Form (ICF) construction technology. This is where Ayars & Ayars, Inc. started in 1985. Our first project enclosed aggregate storage bins and added a lean-to to the existing concrete plant. Thank you, Duane Funk! This batch plant was supplying quality ready-mix concrete for Beatrice Concrete just six weeks from the day construction began. The facility has the capability of batching concrete without an operator present. Mix designs can be sent to the plant via the Internet and this plant will automatically batch the appropriate mix, ready for the truck driver to haul away. This new 325-cubic yards/hr concrete batching facility features integrated computer applications that control all facets of concrete production from order taking through concrete production and dispatch. Underground material storage reduces waste and allows for design mixes that exceed ACI standards. This ready mix concrete plant houses offices and the concrete batch plant for the Arps Concrete Company in Fremont, Nebraska. Erecting the building on cast in place concrete stub walls protects the wall panels from damage. In keeping with our commitment to sustainability, 277,095 pounds of metal was recycled from this project. Studies indicate scrap steel reduces related water pollution, air pollution, and mining wastes by about 70%. Providing a welcoming environment for pilots, customers and guests flying in to Duncan Aviation was the goal of this award winning project. Marble countertops, tile floors accented by teak, and rich colors reflect Duncan’s attention to detail. A stairway leads to the second level pilot’s lounge. Enhanced security systems provide controled access to the tarmac. Ayars & Ayars, Inc. has been building lasting relationships for over 30 years and continues to do so today. Garner Industries is a prime example of one of those great connections. After partnering with us in 2001 to build their current facility, Garner knew who to choose when it was time to expand again. The look of this 40,000 sq. ft. addition will match the existing tilt-up concrete building. Ayars & Ayars, Inc. is proud to have been able to team up with First State Bank Nebraska as they continued their fantastic growth story! This two-story, 18,144 sq. ft. the tilt-up facility now hosts a new branch office featuring state-of-the-art banking technology to enhance the customer experience. The Bank’s corporate and operational divisions now call this facility home as well. The building provides an ideal blend of contemporary and classic design elements. Ayars & Ayars, Inc. completed an addition to Extru-Tech’s existing manufacturing facility in Sabetha, Kansas. The 14,900 sq. ft. the tilt-up facility will mainly be used as office space for Extru-Tech employees. We have also completed addition projects at other existing Extru-Tech facilities in the past. Ayars & Ayars, Inc. was happy to help design and build an addition that met all of the educational needs for the ever-growing Central Valley High School. This edition features a spacious commons area, an excellent gymnasium and locker rooms, new kitchen, and concessions area, classrooms, and a brand-new library. Ayars & Ayars, Inc. was selected to engineer, cast, and erect the tilt-up wall panels at the Alamo Drafthouse in La Vista, NE. Tilt-up concrete construction allows owners to have the buildings they desire in a time-efficient and cost-effective manner. We are casting the building’s walls on-site which accelerates the construction schedule while reducing transportation and handling costs. Ayars & Ayars, Inc. is no stranger when it comes to building skilled nursing facilities. This time, Westfield Quality Care chose us to participate in this project because of various relationships already present between Ayars & Ayars, Inc. and community members of Aurora. This 42,000 sq. ft. wood framed facility will provide new homes to members of the Aurora community and surrounding areas.